Sometimes you come across a recipe online that is so basic, so memorable, that you make a mental note of it and try to recreate it without needing to look at the source online, because it’s incredibly easy and basic. And after making it a few times, you’ve made some minor changes and tweaks, and it feels like your recipe. That’s how I feel about this recipe. This is mine. 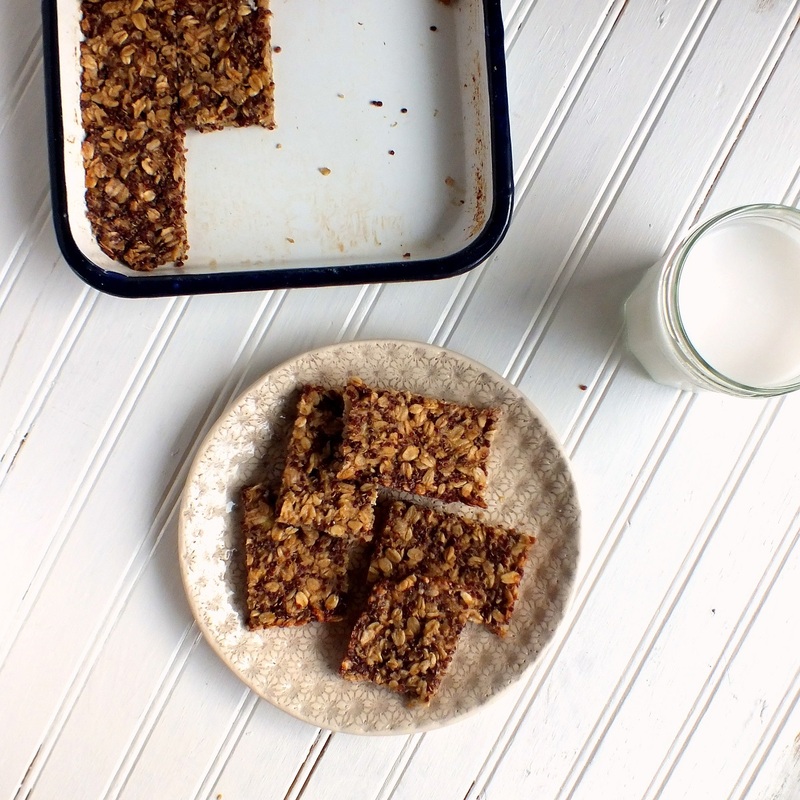 But it’s really a lot of other people’s recipe for oat bars, or granola bars, too. One thing I love about this is the banana flavor, without the banana texture and mouthfeel! Plus it’s something you can make when you need to use up some ripe bananas but just don’t feel like having banana bread again. Another thing is that it is relatively healthy but seems to satisfy my sweet tooth. At least most of the time. I toasted and cooled the red quinoa before using, and I think that helped bring out the nuttiness of it. You might be wondering why not just prepare and eat a bowl of oatmeal? I say this is less moist and more fun! Plus, sometimes I just don’t want to start a long hot summer day eating a hot bowl of oatmeal. Mash bananas in a bowl and add the oil and salt and mix very well. Add the nutmeg and cinnamon, if using. Fold in the oats and quinoa thoroughly. Spread evenly in pan and level top with back of a spoon or small offset spatula. Sprinkle 2 teaspoons of sugar, if using, over the top, emphasizing the edges to get them nicely browned and crisp. Bake for 30 minutes. Cool and cut into rectangles or squares. 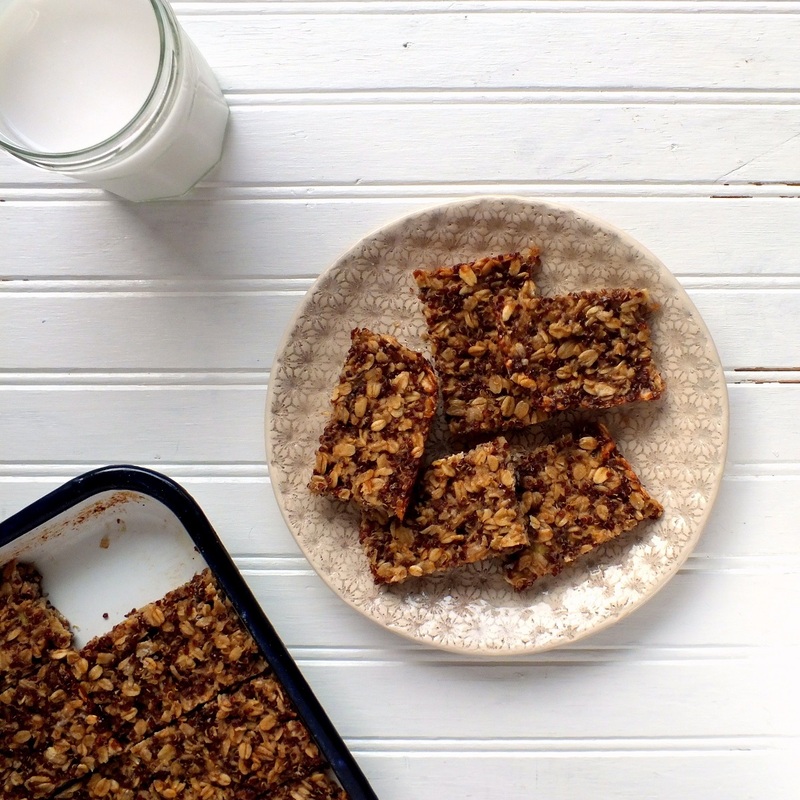 This entry was posted in baked goods, baking, bananas, bars, breakfast, dairy-free, egg-free, food blogging, healthy, low sugar, snack, Uncategorized, vegan, vegetarian and tagged banana oat bars, granola bars, oat bars, quinoa, red quinoa. Bookmark the permalink. These bars are perfect for hiking, love it!